Finally! We're here, almost all of us managed to come to the party! Yesterday night we spend hours getting the garlands up, preparing appetizers and testing the booze. Today we're celebrating our Bread Baking Babes Third Anniversary. Three years of baking bread with a bunch of Babes. Sharing recipes, sharing experiences in life and bread, sharing laughter and some tears. For the celebration we made these fantastic collages of the breads we baked in the past three years and decided each of us would re-make her favorite bread. So that is what you are going to see today! 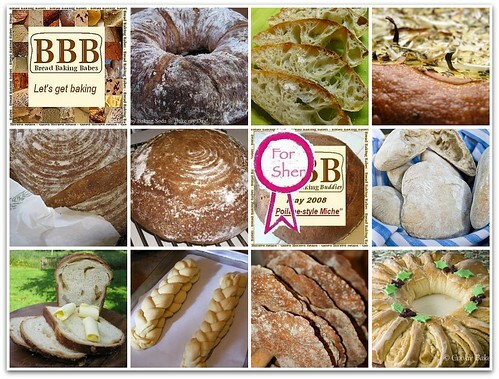 Not one single bread in all Babes variation but each of our blogs will highlight the authors preference. We thought it was easy. It turned out to be very difficult! Which one to bake? 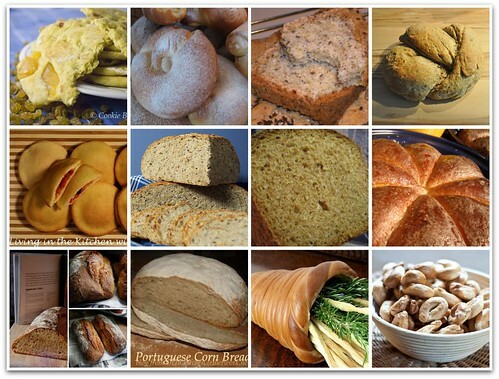 So many great breads, so many "have to bake again". I had a hard time picking my favorite; in the end I asked my family members and baked a couple of loaves to represent their flavors. For Son no 1 it was the Poilane, he added some lettuce, brie and honey and settled in. Not the best picture but we loved that crust! For Son no 2 it should have been the Royal Crown Tortane (and a large tub of garlic butter Mom!). Alas, an influenza virus topped off with a bacteria decided this was not the time... I will bake this one again but couldn't make it in time for the anniversary. This is an older picture just to remind you –and me!- how grand this bread is. For Son no 3 the Brunkans Langa, he is a soup and bread guy and loves to dip this bread in creamy mustard soup. Picture will follow, is on Hubbies camera and not in Holland.. The Husband is definitely a sweetie, he loves his Sugarloaf so that was another one I made. Look at the sugar filled gaps in this one…. And for me? I think I wanted to bake the Pane Francese again, it was so good, I really liked Brunkans Langa a lot, but the Royal Crown is still ranking high on my list. It is such a nice bread to bake and it creates oohs and aahs whenever you put it out on the table. 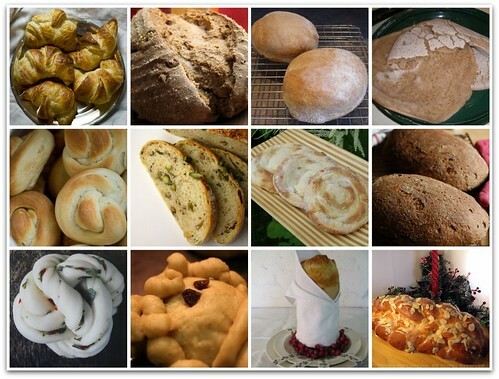 Italian knot rolls… eh… so many great recipes..
What are you going to make from our archives? 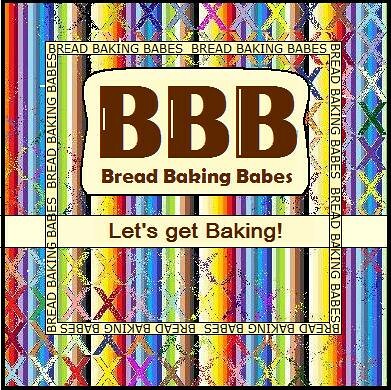 We invite all of you to bake with us, make a choice from our archives (either scroll through my blog posts tagged Bread Baking Babes) or, easier: click and find three beautiful collages with the link to the host Kitchen provided below each. Easy and simple). So please get baking, make a choice and send your info before or on the 29th of February (Name, Blog name, Bread you baked and the link to the post) to Tanna at My Kitchen in Half Cups. She will not bake this time because she has the best reason not to bake... no kitchen! However, she will bake a wonderful anniversary Buddy Round up for us. Oh Karen, what would baking be without you? Thank you for being so patient with me and for starting up the Babes! So glad that I've come to know you, you're such a sweetie ánd that you arranged an Babe-invitation for me of course! Cheers on us and pass the bottle around please. Let the good times continue to roll! I think there's still plenty of bread and I know there are plenty of bottles waiting in the wings!! I'll always be glad we both thought a little bread group would be a good idea ... we couldn't have know that it would be this good. If I were forced, it would be the royal crown it's so lovely to eat and it doesn't hurt that it's such a show stopper. That is so cool that you baked your family's favourites, Karen! Karen, I have so enjoyed being a Babe with you the past three years. I'm glad we get the chance each month (well, most months)but best of all I'm glad we're friends. AND I still haven't made the sugar loaf but your picture above pretty much means that is my next loaf! Ah, bread baking the democratic way - everyone gets to vote... but, usually, it results in only one bread. Well done! It's impossible to pick just one, isn't it! Happy Anniversary, Babe! Congratulations! Three years is a long time and the BB Babes are still going strong. Good for you! Keep up the good work!